SAN MARCOS – There is a new face front and center at the LBJ Museum of San Marcos. The museum’s board of directors named 2013 Texas State University history graduate Elizabeth Delgado as manager at its regular monthly meeting May 1. Delgado replaces longtime museum advocate and operations manager Bill Cunningham who had submitted his resignation to the board last month. Cunningham said he was stepping down from the day-to-day operations of the museum to devote more time to other interests, including writing. 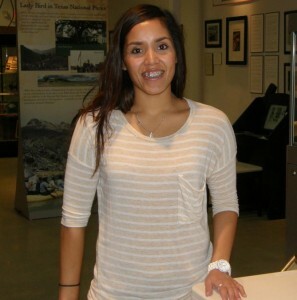 Delgado, a native of San Antonio and a three-year resident of San Marcos, began her work at the museum May 2. She is looking forward to developing her knowledge about museum operations and giving tours of the museum. She will receive her diploma from Texas State during spring commencement ceremonies May 11. Continuing to assist the manager and the board is another young Texas State graduate, Rafael Garcia, who has worked at the museum since 2009. The LBJ Museum of San Marcos, which opened in December of 2006, fills a special niche in the Johnson legacy by celebrating not only the President’s days in San Marcos where he attended what is now Texas State University but also his days as a public school teacher in the South Texas town of Cotulla. It has a unique perspective to share with the public about the man known as “The Education President.” Texas State remains the only university in the State of Texas – public or private – to have graduated a U.S. President. Museum board members and officers include Ed Mihalkanin, president; Carmen Imel, vice president; Scott Gregson, treasurer; Linda Rodriguez, secretary; and members Sherwood Bishop, Ted Breihan, Teresa Hobby, Bill Liddle, John McCrocklin, Vicki Meehan-Clarke, Pat Murdock and John Navarrette. The museum is open to the public without charge from 10 a.m. to 5 p.m. Thursdays, Fridays and Saturdays. Tours and visits on other days of the week can be arranged by calling the museum at (512) 353-3300.